The Red Spotted Purple is native North America with subspecies in Central America. 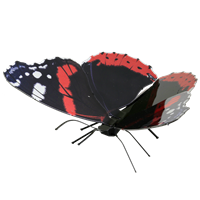 The upper side is mostly blackish-blue with a row of red spots on the forewing. 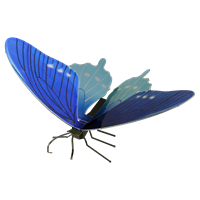 The hindwings are either a bright iridescent blue or an iridescent bluish-green. Both the males and females look exactly the same but one difference is that the females are larger than the males. The Red Admiral is found in temperate Europe, Asia and North America. 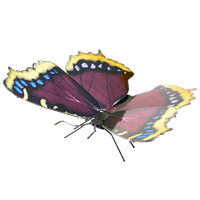 This medium-sized butterfly is identified by its striking dark brown, red, and black wing pattern. More specifically, the dark wings possess orange bands that cross the forewings and on the outer edge of the hindwings; white spots on the dorsal forewings near the front margin; reddish bars on dorsal surface of all four wings. The Pipevine Swallowtail is found in Central and North America. 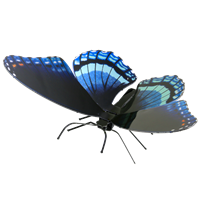 The upper surface of the hindwings is an iridescent blue or blue green with pale, arrowhead markings. The underside of the hindwing has seven orange sub marginal spots surrounded by iridescent blue. 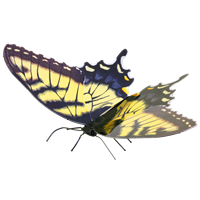 Both surfaces of the forewings are black or dull blackish brown. The Pipevine Swallowtail can have a wingspan up to 3.5 inches (89mm). The Eastern Comma is native to Northeastern America. This butterfly is seasonally variable. 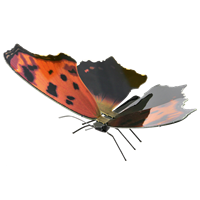 The upper side of the summer form's hindwings are all black, whereas the winter forms hindwings are reddish orange. The underside of both forms is striped with dark and light brown. There is a silvery comma mark in the middle of the hindwing in both forms. Its wingspan is 4.5–6.4 cm (1.8–2.5 in). The Mourning Cloak is a large butterfly native to Eurasia and North America. This powerful flier is sometimes found in areas far from its usual range during migration. The Mourning Cloak has a lifespan of 11-12 months, one of the most extensive lifespans for any butterfly. The Tiger Swallowtail is native to eastern North America as well as Turkey. The male is yellow with four black “tiger stripes” on each forewing. Females may be either yellow or black, making them dimorphic. The yellow morph is similar to the male, but with a conspicuous band of blue spots along the hindwing, while the dark morph is almost completely black. This model is based off of the female yellow morph.